Again and again, especially abroad, the question is put why there is no National Theatre in Germany. For Germany has an undoubtedly rich theatre tradition and in comparable other countries, such as Austria or France, there are national stages. – Yet there was never really a National Theatre in Germany. 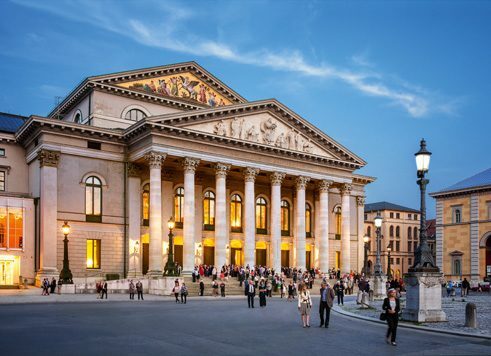 The state theatres, such as those in Karlsruhe, Düsseldorf or Dresden, are not national theatres but theatres of the federal states – thus, in the cited cases, of Baden-Württemberg, North Rhine-Westphalia and Saxony. Culture, it was decided in 1945, is an affair of the federal states. 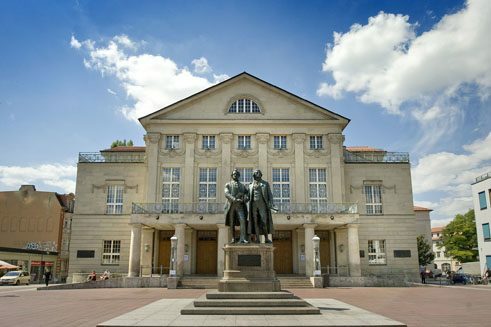 Even the so-called “national theatres” of Weimar and Mannheim differ from the other German stages only in name, not in function. Historically speaking, there was never a clear decision in Germany against a National Theatre, but there was also never a time when it was proposed. The wish has been formulated since Lessing, but it became realistically possible only with the establishment of the German Empire in 1871. At that time, however, there was the Royal Theatre in the Gendarmenmarkt; the German Empire was a monarchy and the Royal Theatre the leading stage. A National Theatre would have been a republican affront. Though theatre emerged from the court theatres, the history of the stage in Germany since the second half of the nineteenth century has been the story of the republican idea, as, for example, Günther Rühle’s comprehensive book Theater in Deutschland 1887-1945 (Theatre in Germany, 1887-1945) has shown. The rise of Max Reinhardt in Berlin at the beginning of the twentieth century, and his takeover of the Deutsches Theater, gave the latter the status of the premier German theatre in the capital city, and so in the entire country. Reinhardt also entertained the vision of a prestigious and representative stage, but when he reached the high point of his work in Berlin, from about 1911 to 1912, he was more interested in expansion than in in fighting for a national beacon. With the end of the German monarchy in 1918, a National Theatre was really conceivable for the first time. But the socialist-republican zeitgeist was then opposed to the idea of such an establishment. The leading forces in theatre were concerned with the council republics rather than with a National Theatre. The national idea was no longer regarded as progressive, as it had been in the nineteenth century, but rather as something conservative and reactionary. And so it has remained. In the GDR, the Theater am Schiffbauerdamm, thanks to Brecht, overtook the Deutsches Theatre in the role of a national and representative stage. In the Western part of Berlin, the Theatre Meeting was launched in 1960, and can be seen as a kind of substitute for a National Theatre, reflecting once a year the diverse, decentralized structure of the German stage. This arrangement has not changed in essence to this day, and no one wants to change anything about it; the decentralized structure of German theatre is its strength. Meanwhile, Ulrich Khuon of the Deutsches Theater has expressed the idea of the “national” in his own way: “Theatres are specialists in the sense of the local. And Berlin preserves in itself the ruptured and often violent history of the last century along with its great present openness. The Deutsches Theater has sought to explore this field of tension, braving even the dangers surrounding a closed form of national thinking. The more precise the sense of locality, the more effective its transferability to other spaces.” Such a way of looking at the question is then again very German, and so representative of German theatre. But there will certainly not be a National Theatre, in Berlin or elsewhere in Germany, any time soon. Peter Michalzik is a writer and journalist. Copyright: Text: Goethe-Institut, Shirin Peter Michalzik. This work is licensed under a Creative Commons Attribution – Share Alike 3.0 Germany license.